The Shakespearean reference “a rose by any other name would smell as sweet” is a reference that is often used to imply that the name of things do not affect what they really are. Well, this famous reference can’t be applied when comparing the benefits of traditional WAN methods to those offered by SDWAN. This blog article will outline the reasons why I am making this assertion. First, let’s start off by defining what exactly SDWAN is, but before we can discuss SDWAN, we first must provide an intro to traditional WAN. Enterprise wide area network, famously known by the acronym WAN, is a private network that connects computers and devices across a company's headquarters, branch, and data center locations. The WAN is like a mammal's spine, it forms the backbone of the body. For a company, the WAN is the spine for enterprise communications and is commonly referred to as the backbone because of this. Currently, Multi-Protocol Label Switching (MPLS) is what is commonly used to provide this service within most Enterprise type organizations. The service can be cost prohibitive for smaller organizations, so the service can also be emulated using cheaper Direct Internet Access (DIA) and even cheaper Internet Broadband circuits as the service for creating an encrypted VPN overlay that can be used to provide the enterprise WAN scenario. Obviously one has its advantages over the other and disadvantages as well, but that discussion is outside the scope of this article. Due to the cost and some of the associated disadvantages with the above WAN technologies, an alternative service has arrived. It is software defined, as well as cloud based, and it comes with a big buzz due to the fascination with anything cloud based these days. The alternative is called Software Defined Wide Area Network, popularly known by its acronym SDWAN. As an alternative to the existing legacy WAN solutions, SDWAN offers IP based cloud networking services to meet the needs of most enterprises. In a nutshell, SDWAN virtualizes the networking services and makes it easier to configure and manage the enterprise network by removing the associated task complexities with the use of a central controller and software. Basically, SDNWAN decouples the management plane (network control) from the WAN device and into a cloud scenario using software. This approach reduces the dependency on technology that requires proprietary hardware. The below diagram depicts the mentioned control plane decoupling to a cloud scenario. Now that we have a high level overview understanding of what SDWAN is, now let's talk about the business drivers for using this solution. With the advent of cloud based technologies, enterprise customers need, or more so demand, to use flexible, open, and cloud based technologies. A lot of the time this demand is driven by cost. I bring up cost because one of the driving factors for the use of SDWAN is to reduce cost associated with interoffice communications. This is normally achieved with the use of cheaper internet broadband connections more efficiently in order to replace, or reduce the associated cost with more expensive technology like MPLS and T1 based services. An inherent feature of using SDWAN is the associated security improvement. The added security is achieved due to the associated virtualization technology and applied using VPN type overlays running efficiently on top of cheaper broadband internet connections. Additional cost reductions can be made possible by removing expansive legacy routing hardware, since connectivity is one touch provisioned via the cloud. This also applies to services running on those devices that includes security and other user based connectivity services. The touch cloud scenario helps to eliminate mistakes across different devices and platforms used. Also, just like other cloud offerings, the ability to scale up or down connectivity requirements during peak periods will also be possible. To wrap up, the main goal of SDWAN is to provide customers with a WAN option that offers incentives within cost, reliability, and security of their enterprise network. This is accomplished by the use of cloud enabled WAN connectivity using open and software based technology as much as possible, while trying to deliver premium services such as VPN, application delivery control, and WAN optimization at a reduced cost (compared to existing legacy WAN technologies). 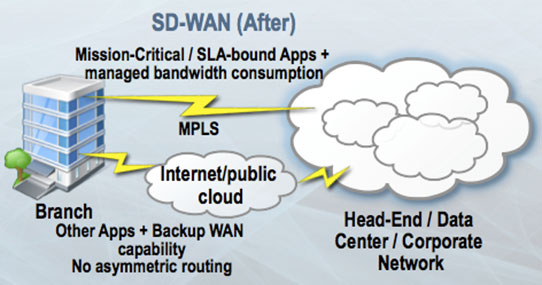 As mentioned in the introduction, SDWAN is the new hot thing when it comes to WAN options for the enterprise connectivity requirements. Analysts predict the SDWAN market to potentially be in the billions of dollars. This is why there are many existing telecommunication vendors seriously investing heavily with either development or acquisitions, as well as new startups. SDWAN is here to stay and will be the new emerging technology for years. It’s advancements will only accelerate and the type of offerings will only grow, since the telecommunication carriers are also making the jump as well. Maybe it’s time to take a look sooner rather than later.